Choosing or making the ideal anthurium potting soil is important if you wish to grow a healthy anthurium plant. 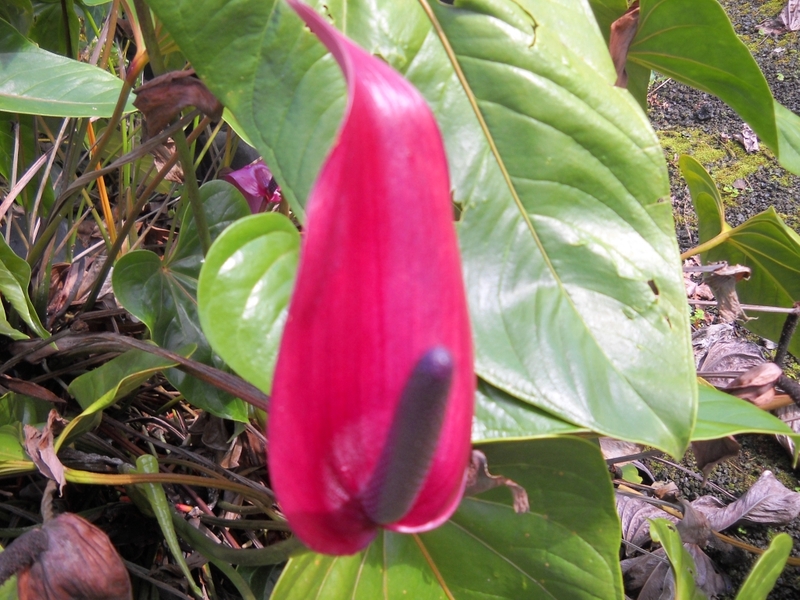 If you use a bad potting soil, your anthurium may grow slowly, stop flowering and even die. Before I tell you how to create the ideal anthurium potting soil, I am going to give you a little background on the growing media that wild anthuriums grow in, so that you can understand what makes for a great potting soil. Wild anthuriums don’t grow in pots. I hope that this isn’t a big surprise. They come from South America and they grow in tropical jungles, primarily upon the trunks of trees. Growing on trees allows them to receive a lot of water from rain and fog, and it allows this water to drain away rapidly. They’re unusual plants because they love moisture, yet continuous exposure to moisture can kill them. Growing on trees allows them to keep their roots out of standing water and allows their roots to receive plenty of oxygen. When choosing or making a potting mix you must remember the reason why they grow on trees. Most out of the box planting mixes retain too much water. So if you use these types of mixes your plant may die from being exposed to too much moisture. The surplus water may prevent oxygen from reaching the roots and allow anaerobic bacteria and fungi to grow. You can prevent this by making your own potting mix. Your mix needs to drain well and it ought to be light and loose to keep your anthurium healthy. Here are two excellent potting mix recipes. This mix will cost you an arm and a leg. Well, maybe not that much. But it is probably one of the better all around mixes for anthuriums. I must warn you, it will take a little work to procure all of the ingredients and mix them well. The links in the recipe below will take you to Amazon.com where you can buy the ingredients if you can’t find them in your local garden store. To make this, just find something to use as a measuring device, like a pot. Then put five scoops of the miracle grow potting mix, two scoops of the peat moss, and so on, into a large container and mix thoroughly. To save time, I would recommend mixing up more than you need at the moment and storing the excess in a water proof bag or container for when you need to repot your anthuriums in the future. If you don’t want to go all out with the high end potting mix, you can use this potting mix recipe, instead. It will still work well and it costs less and is easier to make. The same instructions, as above, apply. Mix thoroughly and make more than you need to save time in the future. When you are growing a lot of anthuriums and I am talking in the tens of thousands (I’ve never counted) it is simply not economical to use commercial potting mixes. But here in Hawaii, the solution is simple and economical. We grow our anthuriums in volcanic cinder. It drains really well, but it also has a lot of pores so it holds on to just the right amount of water too. We buy cinder by the truck load for our farm. But if you don’t happen to have a cinder cone a few miles away, either of the potting mix recipes that I described above should work well for you.